You’ve decided to put your boat up for rent. Huzzah! You are one step closer to making some extra cash on your watercraft. Listing on GetMyBoat is a simple process that includes all the tools needed to create a stunning listing page that attracts many renters. Follow the easy guidelines below and your listing will propel ahead of the rest. While basic information might seem unimportant, or even boring, this will be the information that gets your listing to appear in the search results. The watercraft headline should be used to give your boat listing a unique heading. Try to come up with a unique, straightforward heading that will make your listing easy to understand from a renter’s perspective (e.g., “Rent My Centurion FX22 for Wakesurfing!”). The input fields for “Body of Water” and “Address” will be used to recommend watercraft to renters based on their selected location. It’s a good idea to put an address where the boat can be rented or the harbor where it’s docked. And of course, you should never use your home address for your boat’s location as this information will be posted publicly on our site. To make listing your watercraft easier, we pull the contact information from your account profile to pre-fill your listing. (You will have the ability to change this information if you like.) Having this information listed gives renters an additional avenue to contact you. 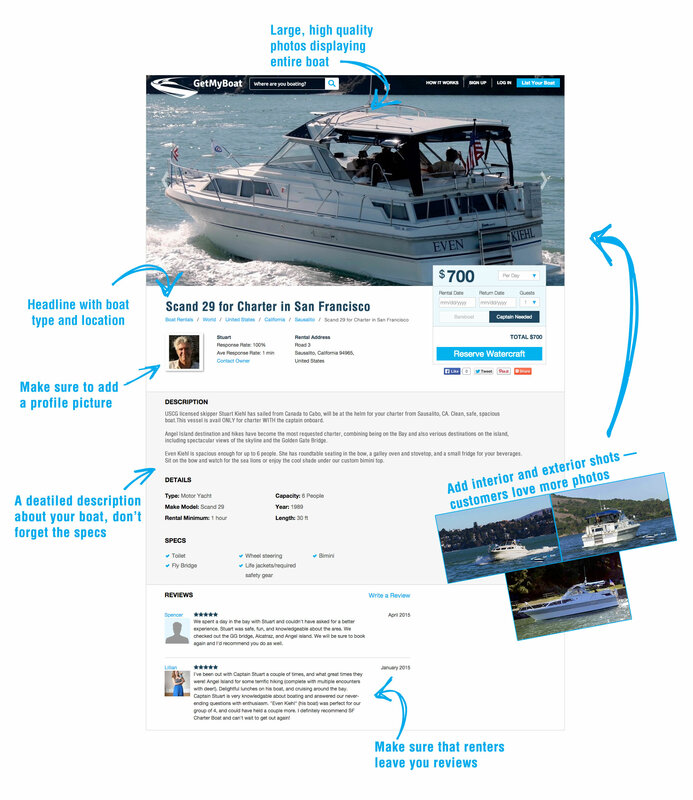 In the search results and the boat listing page, we display a photo of your user avatar. This sets your boat apart from the rest by displaying a photo of yourself or adding your company’s logo. This can be updated in the “Update Account” section of your user profile. Once this basic information is entered, you are now ready to work on the visual elements of your listing. On the same tab for basic information, you will have the ability to add a Youtube video to the listing. All you need to do is shoot a video of your boat, upload the video to Youtube, and then place the link to your video in the video input field for your listing. The video can be anything from a tour of your watercraft, a quick walkthrough, or a clip of it out on the water. This will be a nice supplemental visual that can be added to make your listing really stand out from the crowd. It’s simple. Boats are beautiful and should be highlighted in your boat listing page. The image of your boat will be what attracts the renter to click on your listing and get more information about your watercraft. Make sure the first photo added to your listing is the best image of your boat. This photo will be what displays on the search results page and can be the main factor in determining whether a renter will click on your listing over another owner’s boat listing. We allow you to display multiple photos of your watercraft in an image carousel. You can take advantage of this feature and show renters all that your boat has to offer. For more help with photography, read our article on Watercraft Photography Tips. Watercraft details will be the information that renters will use for filtering watercraft to search through. A few specific fields have been added to the details tab, but for anything not covered in these specific fields, a free text area has been added to the tab for additional details. The more details or additional features your watercraft has, the greater the confidence the renter will have in choosing your watercraft. This free text area is also a great place to put any special deals or booking information for your watercraft. Pricing a watercraft is a tricky aspect of renting that all owners are faced with. The key is to price your watercraft competitively with other comparable listings in your area. The more pricing options you include, the better. We require owners to enter at least one price to protect renters from those annoying listings that say “Call now for a price.” Additionally, you should let renters know how they can pay you by listing your accepted payment methods. 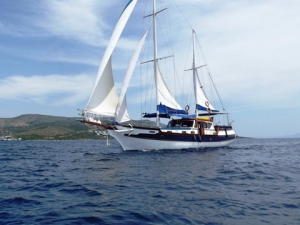 OK, so your boat listing is not a living being, but it can always be evolving. At any time, you can add or remove photos, edit content, adjust pricing, and change the availability. Over time, you can test out different variations of your listing to see what combination yields the most renters. With these simple guidelines, your watercraft should be well on its way to being a stunning listing.